WELCOME TO HOUSE OF LAWOF: Yellow! Yellow! Yellow!!! 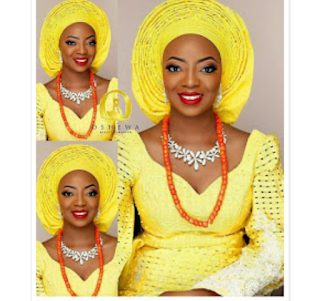 For some of us that think yellow can only be rocked when wearing an English attire, we had to dig up this picture to show us that Yellow is cool even in traditional wears. If you still don't have a yellow outfit in your wardrobe please try to get one. This outfit was worn by designer Kunbi Oyelese for her traditional marriage. This is gorgeous. Well done omo mi lawof.